Beira Rio stadium in Porto Alegre, Brazil is a historic city structure currently that’s currently undergoing a complete renovation as this southern Brazilian city prepares join 11 others around the country in hosting FIFA World Cup matches in 2014. Officially named Jose Pinheiro Borda stadium after a legendary local figure who was instrumental in promoting municipal soccer matches, the stadium has for years flanked the Guaiba River but will soon complete a wholesale renovation and modernization in preparation for the World Cup. Beira Rio is a Portugese term that translates as “by the river,” and is the moniker that virtually all locals use to refer to the iconic structure. With a small group of media and representatives from Embratur, Brazil’s Tourism Board, I toured the area directly around the stadium Wednesday, walking along a newly laid sidewalk adjoining the stadium. 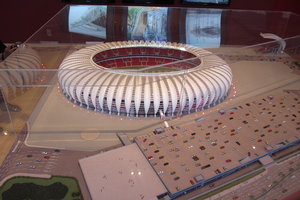 PHOTO: Model of what the newly renovated Beira Rio Stadium will look like in time for the 2014 World Cup. 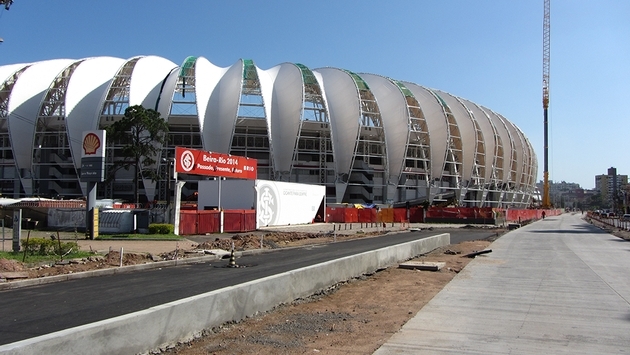 As part of the renovation, Beira Rio is now adorned with an elegant lattice of white sail-like arches that ring the stadium’s entire perimeter. 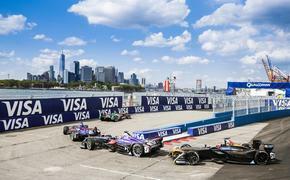 A new auto esplanade leading to the arena is also under construction, along with a massive parking structure and a series of bridges creating easier access to and from the surrounding area. Beira Rio stadium couldn’t be much more conveniently located. The Guaiba River is itself a major draw for tourist and locals alike, adjoined by a long walking and biking path that stretches nearly the entire nine miles of the river’s shoreline. The path is heavily used by local residents for jogging, strolling and biking. PHOTO: Overlooking the Guaiba River and Beira Rio Stadium. The picturesque riverside area is also distinguished by the historic Usina do Gasometro, a former power station that has been renovated as an artists’ workshop and gallery, and the Museu da Fundacao Ibere Camargo, the first contemporary and modern art museum in the state of Rio Grande do Sul, of which Porto Alegre is the capital. Lake Guaiba extends nearly the entire length of Rio Grande do Sul from north to south and was the initial point of entry for the Azorean Portugese who settled in the region in 1752. The river region is famous for its sunsets and the work of Portugese architect Alvaro Siza, who designed the Museu da Fundacao Ibere Camargo. A chain of hills overlooks the river and provides unparalleled views. Because the stadium is on an accelerated construction schedule to ensure the structure will be ready when the games begin in June, we were unable to venture inside, but there is presently a small exhibition office right outside the stadium which includes a detailed model of the stadium complex as it will look upon completion.